North Oxford is the wealthiest part of a wealthy city, where BMWs sit in gravel driveways and wine bars nestle amongst delicatessens and stylish cafes; a part of the city I always yearned to belong to as a kid, but never quite did. It was where I went to school, and where we had our first offices when we were building Elgg. In keeping with the rest of Oxford, it’s suddenly begun changing dramatically over the last couple of years (I’ve joked a couple of times that someone at the City Council planning office must have died, but this may not be too far from the truth; despite a glut of brilliant minds and genuine creativity, the city itself has always been stiflingly conservative). One of the newcomers is The North Wall, an arts centre that actually sits a few doors down from that first Curverider office on South Parade, and is in some ways more exciting than any other arts space in Oxford. From hip hop comedy dance to puppetry, its events seem to bring new blood. 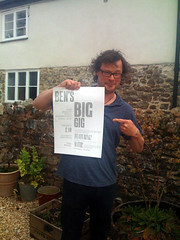 Ben’s Big Gig was probably the first gig of its kind. 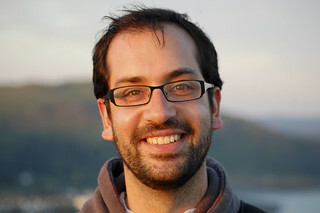 Ben Walker is Internet famous for his Twitter Song, an in-joke that, appropriately enough, has been bookmarked, re-tweeted and blogged all over the web, and attracted praise from the likes of Demi Moore. He’s also a genuinely talented songwriter and musician who has been playing around Oxford for years at various events, including a regular stint at the now-defunct QI Club (which was associated with the TV show of the same name). Together that was enough to sell out the arts centre, as well as attract hundreds of visitors who watched live over the web – Nick Gill’s gorgeous lo-fi poster, pasted up all over town, couldn’t have hurt either. A Twitter wall on the back of the stage read out feedback as it happened, forming a back-channel to the music and allowing the audience to heckle the comedy warm-ups with relative safety. All of this felt not like a technological gimmick, but an organic part of the experience. Live web gigs happen all the time, but they’ve usually got major backing. Sandi Thom was famously discovered through webcasts, but it was a PR stunt: she already had a major publishing deal, and at the time the streaming technology would have cost tens of thousands of dollars. Times have changed: although it’s probably not free, technological improvements have brought live streaming within reach of independent artists. Ben’s the real deal, a performer with old-school talent who just happens to be using contemporary tools to reach his audience. We’re going to be seeing much more of this. However, the first-mover advantage definitely holds water. At the end, as I was leaving, I told Ben that he needed to do it again. He confirmed that he will; I suspect the audience will be even bigger next time. The delightful picture of Hugh Fearnly-Whittingstall was released under a CC attribution license by Ben Walker.